Yesterday was the last day of my temporary job. I had to work really long hours around the end of the month, which is unfortunate as those are some of the best days to find stuff. However, I definitely won’t be working for a while and I’ll be able to devote myself full-time to finding trash and writing the blog. I’ll also be a bit more comfortable knowing I have a somewhat nicer cushion in case things go awry. I had a chance yesterday after my shift to spend some time in the McGill Ghetto on “move-out day” when lots of kids leave town to go home for the summer. It’s one of the most intense trash days of the year, as the combination of poor planning, ignorance, and privilege make it so that there’s an abundance of awesome trash. There are always incredible amounts of clothes, food (canned, open but usable), electronics, furniture, and books. 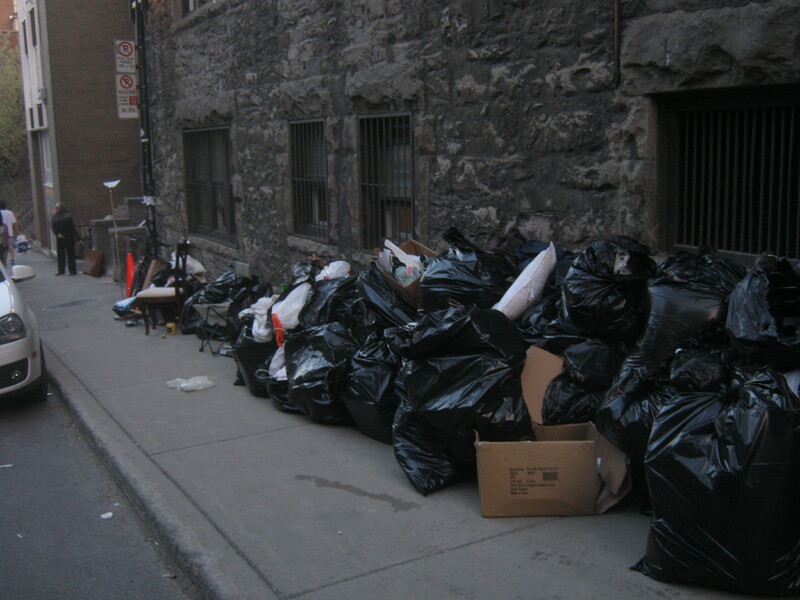 This picture of trash was just a tiny amount of what could be seen on the streets and in the alleys. My room-mate and I scoured the area for a while and accumulated a tonne of stuff we didn’t actually want but didn’t want to go to waste. I had a van so I was able to bring a bunch home. We brought home mostly books and clothes, which we plan on washing and putting in the next yard sale. It’s fun looking for stuff, but when you get home and look at it all it’s a bit overwhelming. 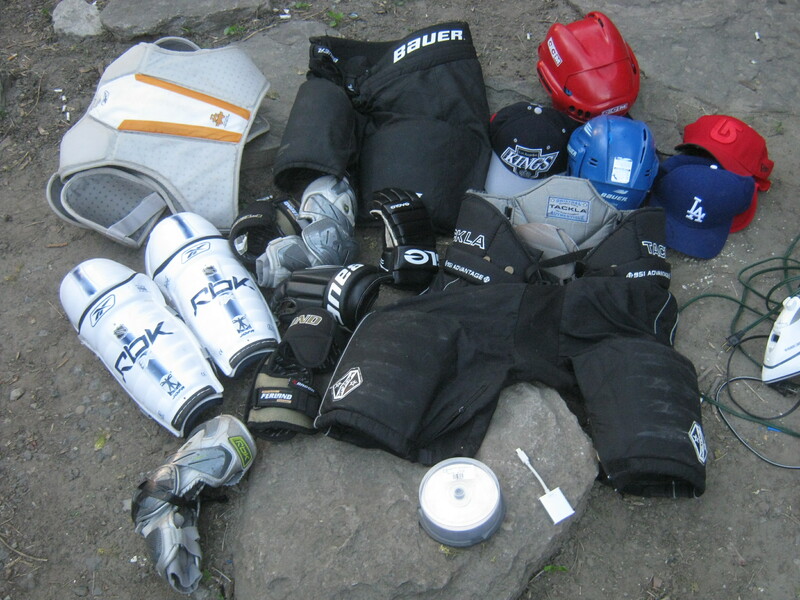 The most individually noteworthy find was this hockey gear I found in some bins on Durocher near Milton. I never played hockey but this stuff looks perfectly fine. It’s a shame to throw it away as it’s really expensive to buy new or used and lots of people would be happy to have it. I brought it home but I don’t have room to keep it. If anyone has interest in buying any of this stuff let me know and I’ll give you a good deal! Looks to me like the person who owned the hockey gear never played hockey either! I always look forward to seeing a new post on your blog. You always keep it interesting. Sometimes it’s hard to judge which is the peak day. I thought things might be good on the weekend, parents coming to bring the kids home, but it wasn’t that great. On the other hand, I skipped Wednesday, since I had checked four days in a row. It always nags, “did I miss something?” but it really is random, and I was tired of the routine. I suppose if I’d found something “really great” that would have pulled me back, but I’ve seen better in previous years. Tuesday seemed a good day. It can be an interesting time, since there are people moving within the area, carrying their possessions by hand, or on a dolly, or even an office chair. And it seems like some of the students either moving in, or staying the summer do drag home furniture (easy for them since they live around there) that someone else has tossed out. Indeed, someone looking carefully probably could supply a new apartment. But in some ways it’s a different situation from regular moving. A lot of July 1st moving is people changing apartments, while I’d guess some of the McGill garbage is people leaving town. The further you go, the less you want to carry, hence the dumping. Though it can also see silly, if you are starting out after graduating, that electric drill will be as useful in the new apartment as it was while at McGill. I was looking for a 3-hole punch last year, found about 5 of them, at least 3 were heavy metal types. On one level, it’s symbolic of putting academia behind, yet the reality of life may actually call for a 3-hole punch in the future. There seemed to be less electronics, other than the ubiquitous printer/scanner combination (taking over from the plain inkjet printer, which took over from the dot matrix printer). I wonder if some of it is being recycled? It used to be common to see computers, now that doesn’t happen. But, that may reflect a switch to laptops; more portable they are seen as less of a burden than a desktop, so they are kept. Last year one McGill group was trying to collect junk before it was tossed out (they had posters, but it was never clear if they;’d give the stuff to newcomers, or sell it), I didn’t see such posters this year. Yet, that sort of thing, and so many of the comments here ignore the fact that there are people who look for things in the garbage, so it may get found anyway. I’d much rather find computers on the sidewalk than see it go to some “ewaste collection” where I wonder if the stuff gets a second chance. I can see value in older equipment, would even know that something older is “collectible:” but I suspect a lot of those recyclers sell off the most recent, and junk the rest, while some of the “older” stuff could still be used, some of the broken stuff could be repaired. I found my first LCD monitor at McGill 3 years ago, I didn’t see any this year, yet they have been relatively easy to find now, either working outright (the smaller sizes) or needing some work on the power supply )a whole lot easier on LCD monitors than old CRT monitors). I’m not seeing LCD tv sets, too small and easy to carry, though the large CRT tv sets still appear, nobody wanting them. I found a USB extension, the full size USB connectors on each end, and both a mini and a micro USB cables, useful to have around, maybe the most useful things I found at McGill this week, things I might otherwise have to spend money on. The 6.1mp camera was neat, but I hardly need another digital camera. NOVA West Island is a not-for-profit, charitable, volunteer-driven and community-based healthcare organization that would love recyclable donations. They sell a variety of items in their thrift shops to raise money so that they can continue to offer this much-needed health care. There are so many charities asking us for donations and so many charities just dump stuff that doesn’t sell in the garbage.Even good stuff in working condition is dumped in the garbage by many charities.Makes me wonder why some charities solicit so many donations.